Yeah, OK. So I promised Sock Scarf Two pics and didn’t get them up. Life is very busy right now! 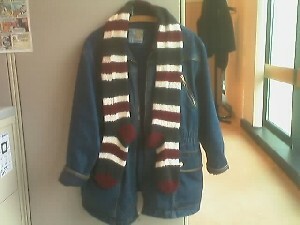 Here, however, is the bad-cell-phone-camera version of Sock Scarf Two draped around my coat. I rather like it. It’s just the right length and width. I’m not all that happy with my grafting at the point the two socks meet. If I ever make another sock scarf that turns into a project from hell and that I’ll end up hating by the end sock scarf 3, I think I’ll either go back to the toe-to-toe method I used with the first sock scarf, or use a provisional cast-on and work both socks top-down. I will also put some kind of cable or other interesting pattern like I did with the first one. Six feet of stockinette… ugh. I’ll try for decent pics by the weekend.